This post was written by Mary Schmida, Senior Research Associate, Teacher Professional Development Program at WestEd. 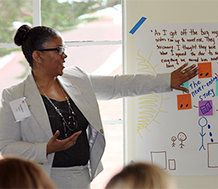 This is the second in a series of blog posts describing what participants will experience during this summer’s Quality Teaching for English Learners (QTEL) professional learning institutes, which will take place in San Francisco, California from July 16-27, and in San Antonio, Texas from July 23-27. Click here for more details. Who participates in the QTEL Summer Institutes? Every year, teachers and administrators from all over the United States and abroad participate in the QTEL Summer Institutes. Hailing from education systems as distinct as their geographies – Alaska, California, Texas, and even Finland, Thailand, and other countries – educators and leaders worldwide are provided the tools and expertise they need to help their students achieve college and career readiness. How do you address different areas of participants’ expertise? Participants can select from among five QTEL institutes, each geared toward teachers or educator leaders, and each focusing on a crucial topic in the education of English language learners. For example, due to the wide range of language comprehension amongst English learners, we have one secondary institute geared toward students at the intermediate and advanced levels, and another for English learners at the beginning levels of proficiency. Teachers learn how to deliberately design and implement instruction for English learners that builds their autonomy and aligns to rigorous content standards. Leaders learn how to model and support the development of a culture that provides quality learning opportunities for all students – within districts, schools, and classrooms. What do the institutes have in common, other than quality teaching for English learners? Whether you attend a teaching, coaching, or leadership institute, you will see that scaffolding is at the core of our work. It’s how we bring sociocultural and sociolinguistic theories to life, link theory to practice, and bring operational and thematic cohesion to our institutes. We ask participants in all of our institutes to consider how we teach students to use language, and how we apprentice students into academic practices using language and discourse. How can I find out more about the QTEL Summer Institutes? Visit our QTEL Summer Institute page for more information, including registration details. And don’t miss my featured QTEL talk, “From Apprenticeship to Appropriation”, given at a previous Summer Institute.